New rental on the market - available starting July 1st. Special July Rate - 7/1-7/7 only $400. August weekly rates! This 3 bedroom stucco courtyard villa in Biscayne Villas in Tamarind Grove offers both privacy and convenience. The location offers numerous options including up to 9 executive golf courses all just minutes away. Tamarind Grove, Buttonwood and St James pools are within walking distance and family pools at Stirling Heights and Fishhawk Recreation centers are a 2 minute golf cart ride away. Also at Stirling and Fishhawk, enjoy tennis, pickleball, shuffleboard, horseshoes, billards plus daily activies such as yoga, and dance. Centrally located between Lake Sumter Landing and Brownwood townsquares, each can be reach by golf cart in about 15 minutes. There, you have numerous dinning and entertainment options, movies, shopping and of course nightly live music and dancing. The home itself feature numerous upgrade that make this stand out as not your typical rental. The fully stocked kitchen features granite countertops with under and over cabinet lighting. There are King sized beds in both the master suite and the Palm guest suite (private bath's for each). Each bathroom has solar tubes. There is an inside laundry so no need to drag your clothes into the garage! 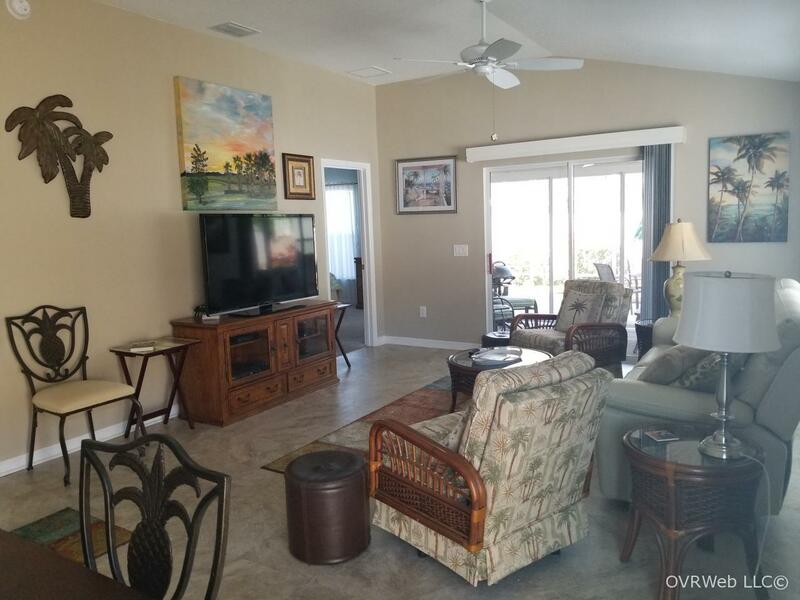 Vinyl tile flooring in the spacious and open main living area with ample seating and dining for 6. A large 55" flat screen TV is accompanied by 2 other TV's in the master bedroom and a TV room/ den - perfect for quiet reading. Open up the home to the beautiful weather with sliders that flow into an east-facing covered lanai that has stackable sliding doors that completely open up to a screened in birdcage giving you almost 200 square feet of outdoor living space. The private side courtyard has outdoor seating and gets plenty of sun through most of the day. Enjoy a hot cup of coffee on your covered front porch, nicely shaded from the late morning sun. A 2 seat Yamaha Gas Golf cart is to be purchased in time for rentals beginning July1st and is included in the rental. Rentals of over 1 month will include 2 Villages Temporary Resident ID Lifestyle passes that enable resident golf rates and access to the only tee times reservation system, discount movie tickets at the squares, and access to Regional recreation centers. Free Guest passes are included for rentals of 1 month or less that provide access to pools and golfing at guest rates. Tamarind Grove and St James Pools Stirling Heights and Fishhawk Rec Centers SeaBreeze Regional Recreation center Across from Southern Star golf course with Yankee Clipper, Bonita Pass, Tarpon Boil, Redfish Run, Turtle Mound, Sandhill, Heron, and Pelican executive courses all just minutes away. Cane Garden Country Club with 27 holes of Championship golf. Rentals of 1 months or less require a 50% refundable deposit upon contract signing. .Rentals of more than 1 month require a 25% deposit upon contract. Balance due 45 days before start of lease. Refundable Security Deposit based upon duration the rental. Absolutely NO SMOKING in the villa or lanai - will result in forfeiture of entire security deposit. No pets are permitted.